The famous Kronk Gym is being demolished today. Photo by Mark Hall. 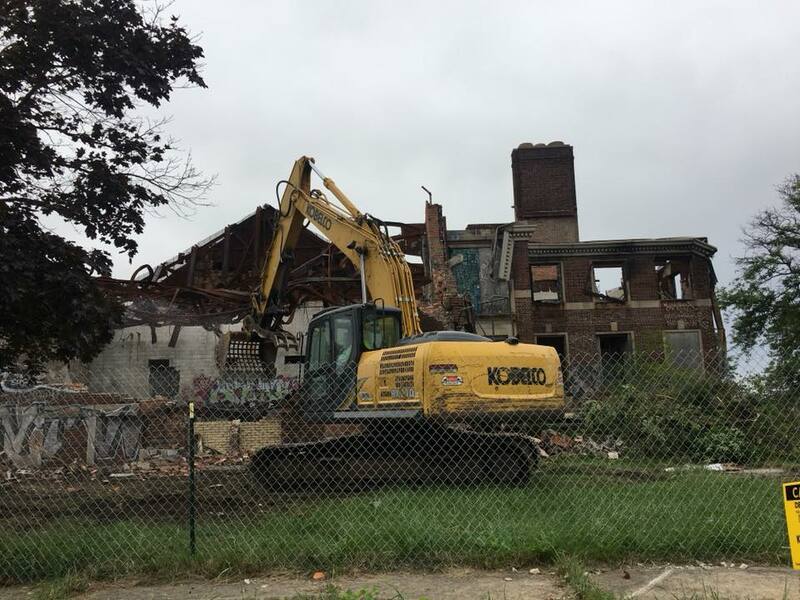 Detroit’s Kronk Gym, the storied and world-renowned boxing powerhouse that produced more than 30 world champions, most notably Tommy Hearns, is being demolished today after it was gutted by two suspicious fires in the past year. The gym was in the basement of the long-abandoned Kronk Recreation Center, a squat, two-story building on a neglected stretch of the city’s west side at McGraw and Junction. Firefighters battled two fires at the brick, graffiti-strewn building on the city’s west side since October. Legendary trainer Emanuel Steward, who died in October 2012, transformed the dingy basement of the city’s first recreation center into a boxing powerhouse by the 1980s, producing more than 30 world champions, 50 amateur champions and three Olympic gold medalists. Kronk Gym. Photo by Steve Neavling. But budget cuts forced the city to close the gym and recreation center in 2006. Efforts to reopen the gym were stymied when thieves stole copper piping. A year before his death, Steward told me he wanted nothing more than to revive the gym and give troubled Detroit children a place to find hope and purpose. Hearns echoed those sentiments a few days after his long-time trainer and friend died. But like many famous landmarks in Detroit, the building crumbled under neglect and was surrounded by trash and decay. Scrappers stripped the building of everything of value, and graffiti covered the interior and exterior. Discarded sofas, tires and trash were strewn across the property, which was overgrown with long grass and weeds. Until the gym closed in 2006, it primarily nurtured underprivileged Detroiters.